We are financial solutions provider, offering a full range of bookkeeping and accounting services for small to mid-sized businesses. 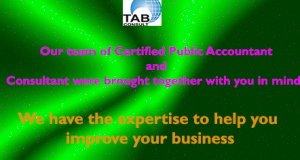 Depending on your company’s needs, we partner with you as your bookkeeper, accountant, controller, business advisor, part-time Chief Financial Officer – CFO or the entire department. All of our accounting services and solutions are scalable during periods of peak activity, and then can be scaled back when they are no longer required. By partnering with us to help you manage key non-core functions, you can concentrate efforts on maximizing your core business, which is essential to businesses that are positioned for growth.